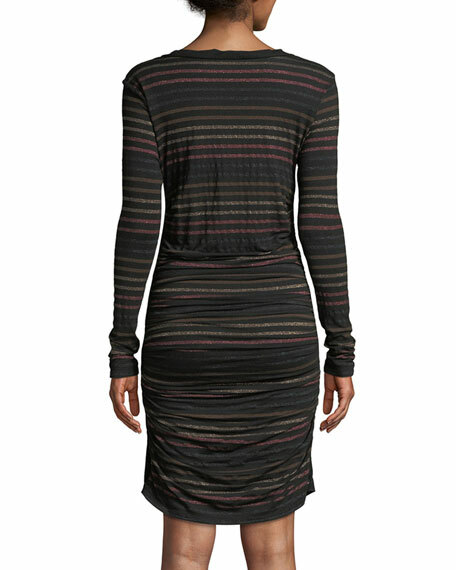 Veronica Beard "Daphne" striped dress with metallic detail. Aidan by Aidan Mattox metallic knit mini dress. Approx. 35"L down center back. Surplice V neckline. Long sleeves. Wrap-front illusion. Aidan by Aidan Mattox metallic knit mini dress. Approx. 35"L down center back. Surplice V neckline. Long sleeves. Wrap-front illusion. Body-conscious silhouette. Slipover style. Mini-length hem. Polyester/spandex. Polyester lining. Dry clean. Imported. Model's measurements: Height 5'11"/180cm, bust 31"/79cm, waist 23"/58cm, hips 34.5"/87cm, dress size US 0/2. Finley dress in floral velvet brocade and crepe trim. Approx. length: 36"L from shoulder to hem; 37.8"L down center back. 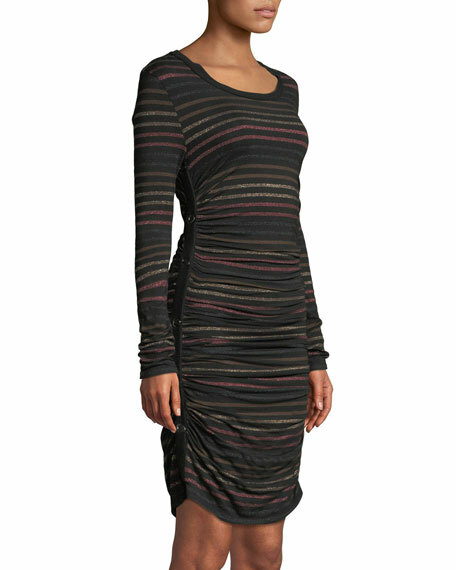 Joan Vass interlock dress with dramatic draped front; available in your choice of color. Crew neckline. Long sleeves. Shift silhouette. Joan Vass interlock dress with dramatic draped front; available in your choice of color. Crew neckline. Long sleeves. Shift silhouette. On-seam pockets. Asymmetric hem. Pullover style. Rayon/polyester/spandex. Acetate pocket lining. Machine washable. Imported. Model's measurements: Height 5'10"/177cm, bust 33"/84cm, waist 25.6"/65.2cm, hips 35.8"/91cm, dress size US 2-4/FR 34-36. MICHAEL Michael Kors cocktail dress in glitter crepe. Crew neckline. Long sleeves. Fit-and-flare silhouette. Drop waist shirred skirt. Straight hem. MICHAEL Michael Kors cocktail dress in glitter crepe. Crew neckline. Long sleeves. Fit-and-flare silhouette. Drop waist shirred skirt. Straight hem. Back zip. Polyester/spandex. Hand wash. Imported. Model's measurements: Height 5'11"/180cm, bust 32"/81cm, waist 24"/61cm, hips 35"/89cm, dress size US 2.